For many shoppers, product fit, immediate gratification, expert advice, or being part of a local community are integral parts of their purchase experiences, especially for their first interaction with your brand. With Locally’s Product Locator, you can facilitate a seamless online-to-offline transition for these shoppers by guiding them directly to that item in-stock in a nearby store. 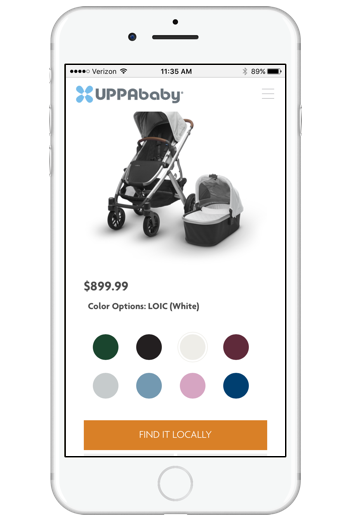 Locally’s Product Locator for brand site product pages shows shoppers nearby availability—right down to color and size—and facilitates transactions for in-store pickup. Locally's Product Locator is powered by inventory feeds from your dealers or brand stores. Our universal inventory sync allows retailers of nearly any technical sophistication to participate. Inventory is sent automatically at least once a day, often hourly, and in some cases in real time. 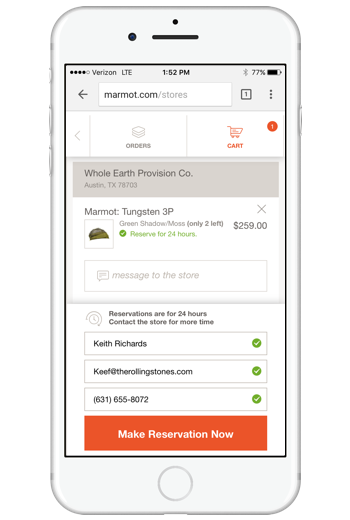 Locally’s Product Locator makes online-to-offline shopping actionable for your site visitors by adding a “Pick Up In Store” check-out option to your website, fulfilled by your best stores. Our Product Locator is customizable to match both your website and advance your business goals. Every Product Locator is custom designed to seamlessly match your site. Whether you are a major D2C brand seeking a laser-like approach for brand stores and key dealers, or you're seeking to build your site around this as the primary CTA, we have a solution for your company. What if you knew what products shoppers were seeking out in-stores? What sell-in opportunities your retailers were missing? Every click and page load on Locally is tracked at the product and location level to provide your team with actionable insights on shopper behavior. 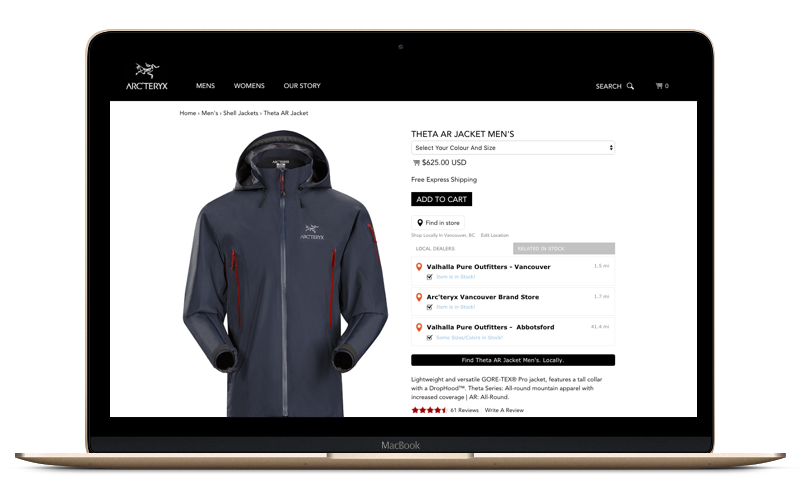 Arc'teryx guides shoppers to nearby stocking brand stores and key dealers. When an item is not in-stock nearby, our Product Locator disappears from the page. 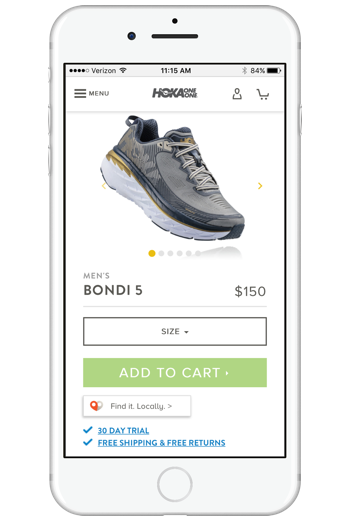 HOKA uses Locally's Product Locator to guide shoppers looking at a specific shoe to the right store where they can try on, pick up, and go for a run all in the same day. Try it out! Jump to St. Louis, MO, as a good city to see rich results. 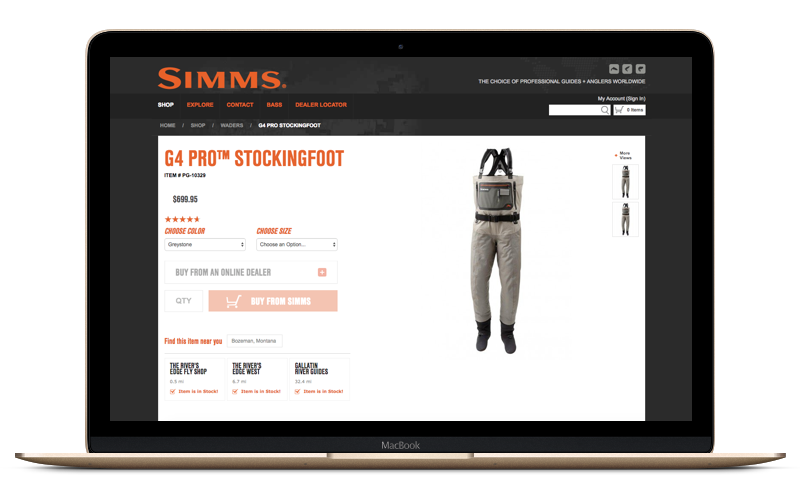 When you load a SimmsFishing.com product page, local stores and their product availability for that item are prominently displayed. Leading specialty baby brand UPPAbaby knows there is no better experience for expecting parents than having an experienced specialty retailer taking care of them every step of the way. With Locally's Product Locator, shoppers know exactly where to go to check out and buy specific items, right down to their favorite fabric. Want to learn more about how Locally's Product Locator can improve your shopper's experience and strengthen dealer relationships?